T.Y. Harbor Brewery (TY) has been around for quite a while. It was the only brewpub in Tokyo until Two Dogs opened up at the end of 2013 and the Hamamatsucho Devil Craft opened in 2013 as well. TY has had a big reputation as being a great place to go and after my visit there I must agree. I felt it was a great place but there are a lot of little things that didn’t really gel with me. They have a lot of experience and their menu is great. I would love to go there more often but there are only two reasons I won’t go often. The first is the price. They are a little expensive but the quality speaks volumes of why they are so expensive. The other reason is that they are not located in a convenient area. They are located a little far from a major station and the easiest way to get there is a little expensive for me. It won’t stop me from visiting them again in the future but it had taken me over 5 years to finally visit their brewpub so I don’t expect to be going there again anytime soon. Getting to TY Harbour is not as easy as it may appear. If you are going from Shinagawa, expect a 30 minute walk from the station all the way there. Thankfully I was with a friend who used to live there so we took some of the side streets that weren’t too busy and made it there with relatively no stress. From Tennozu Isle Station, it is confusing if it is your first time going there but I was going the reverse direction and it might be easier to find TY Harbour if you are starting from the station. The Rinkai line looks easier to find TY Harbour, but it is a little further away from the restaurant. When you get there, you immediately feel as if you are in the wrong place. The main entrance is on the waterfront and it actually feels as if you are going through the back entrance rather than the main entrance. Once you get inside, you are in the main waiting area which is pretty beautiful. It is very spacious as they use an old warehouse. 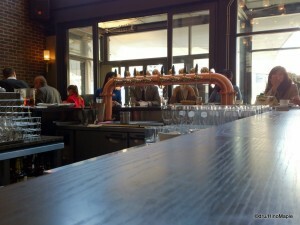 The design of the brewpub was well done and you can see some of the functioning tanks where they make their beers. The main waiting area is also used for seating during the rush times. I went to TY Harbour for a Christmas lunch and the bar was devoid of bartenders. I felt it was a waste of resources as I wanted a beer right then and there but no one was available to help me. They did offer free water and tea for those waiting which was a nice touch. I can understand why they didn’t have any bartenders in the waiting lounge during lunch service; I can only hope they have bartenders there during the dinner service as it would be a big waste of space if there wasn’t a bartender there at night. The main restaurant area was nice. The main dining area has a very upscale west coast feel and I loved the look when I walked in. It was a little dark overall but that is to be expected in a warehouse. The walls were full of art that looked a little out of place but I learned later that it was part of an artwork project by TY Harbour to allow local artists, or any artist, to display their works for free. Recently, I have been going to these types of restaurants for the beer and needless to say, I had some beer at TY Harbour. They are known for their beer and their beer is pretty good. I had the Pale Ale and the Amber Ale. Both were good but nothing too special. I found the quality of the beer to be good and the look of the beer was also good. I enjoyed seeing three choices for size as it is often hard to find good choices for size. Usually you will see pints and half pints but they also had large sized beers too. The large beers were pretty big so I stuck to the regular pints. The Pale Ale was flavourful but not overpowering and the Amber Ale had good hints of flavoured malts. I personally prefer stronger flavours but felt it was a good mix. Their list of beers was excellent and they really cover their bases. They have a beer for everyone and seasonal beers as well. I didn’t try the seasonal beer but it was good to see them try different things from time to time. I don’t think they’d go crazy experimenting with different beers but they didn’t do a bad job. They are very business oriented and they are successful because they do everything very well and cater to their wide market. The food is probably the main reason people visit TY Harbour. During lunch I noticed a lot of married women having lunch with their friends as well as people taking their clients out for business lunches. It was really busy until they closed and the crowd was very different to what I would expect to see at a brewpub back home. I had one of the most talked about items on their list, a burger. It was a good basic burger that was very light. They actually asked me how I wanted my burger done and it was done very nicely. I got it medium and it came out a little under medium but close enough. The vegetables were good and the fries were excellent. I also got the standard ketchup but also some mayonnaise mixed with something else. From my other friends who have visited TY Harbour, they say the short ribs and mashed potatoes were really good and I may have to try it some other day. I have to say that their food was probably better than their beer. It seems as if they really look for quality ingredients and like most other brewpubs in the Kanto area, they try to make sure the food is done right. I can completely understand why no one was really drinking during the lunch service and I can understand if most people don’t drink at all. When you look at the list of other restaurants they have, many of them don’t even feature beer rather they highlight their wines instead. It seems like a sad thing when a brewery opens a restaurant that doesn’t feature beer but they are very focused on the business side of things and you can’t say they aren’t successful. 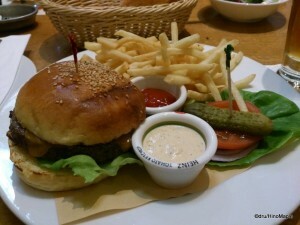 TY Harbour is a great place and if I lived in Shinagawa and had a lot of money, I’d be there more often. They may not have the kinds of beer that I would love to drink on a daily basis but the food more than makes up for it. They show their maturity as a restaurant and the servers are pretty good. They aren’t the best listeners as they did make one mistake by giving my friend an IPA rather than the Imperial Stout he ordered. They have a full range of beers to suit everyone’s tastes and it is something I can easily respect. Even if you don’t like beer, TY Harbour is a place to go to get really good American style food in a brewpub atmosphere. Remembering your wallet is also necessary as the food will set you back a few yen, but for special occasions, it is probably worth it. This entry was posted in Tokyo Food and tagged Amber Ale, beer, brewery, craft beer, japan, Pale Ale, Shinagawa, T.Y., T.Y. Harbor, T.Y. 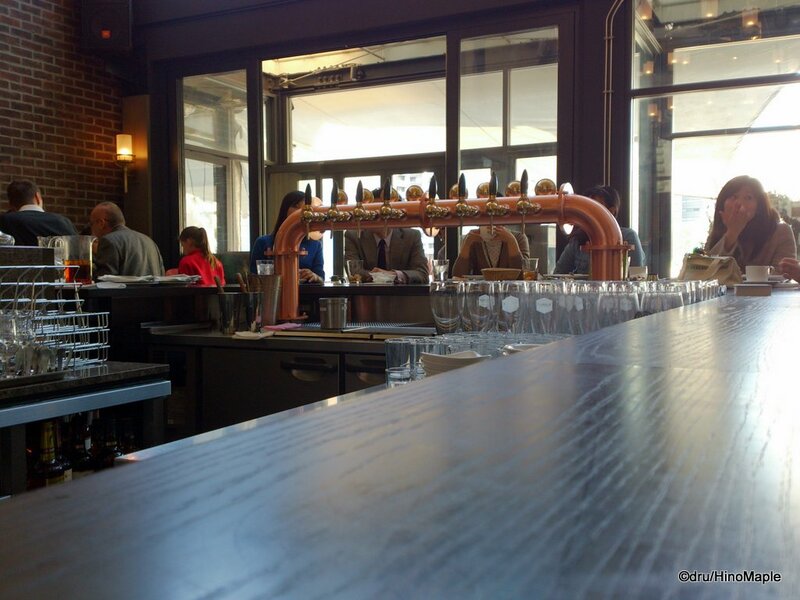 Harbor Brewery, T.Y. Harbour, T.Y. 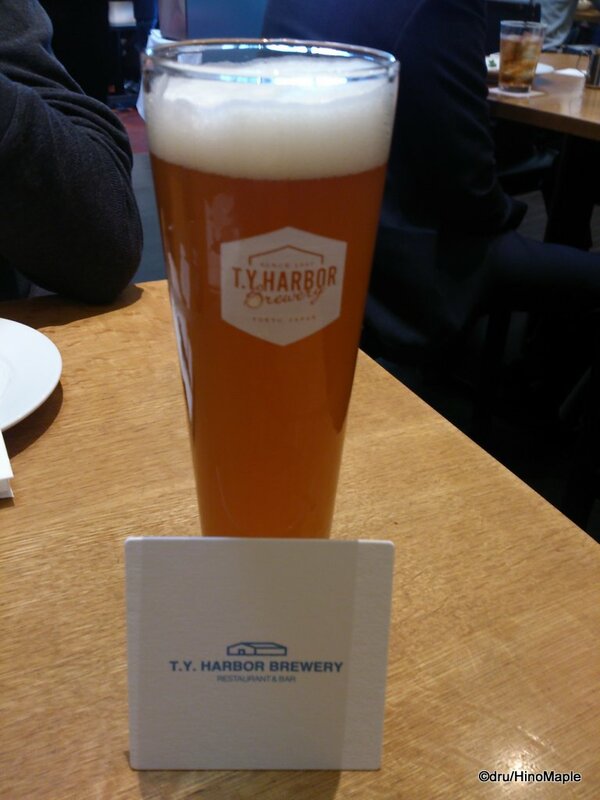 Harbour Brewery, Tennoz Isle, Tennozu Isle, tokyo, TY, TY Harbor, TY Harbor Brewery, TY Harbour, TY Harbour Brewery by Dru. Bookmark the permalink. 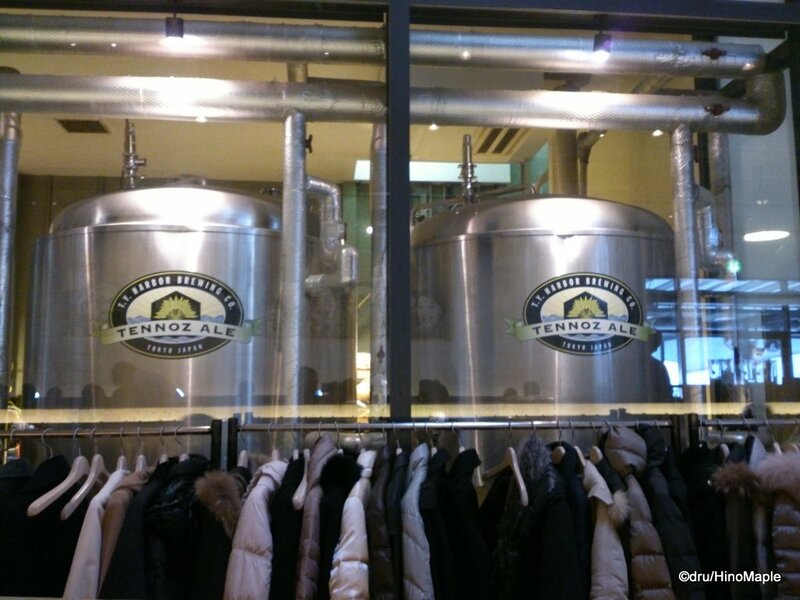 There’s a brewery in Tokyo? Whatever next? Thirty minute walk? That’s just a nice warm-up for a REAL walkpedition. Roll on, last Friday in March! Heh heh. I know what you mean. I tend to put off reading blogs for a week or so lately. I need to do the same in the next few days. 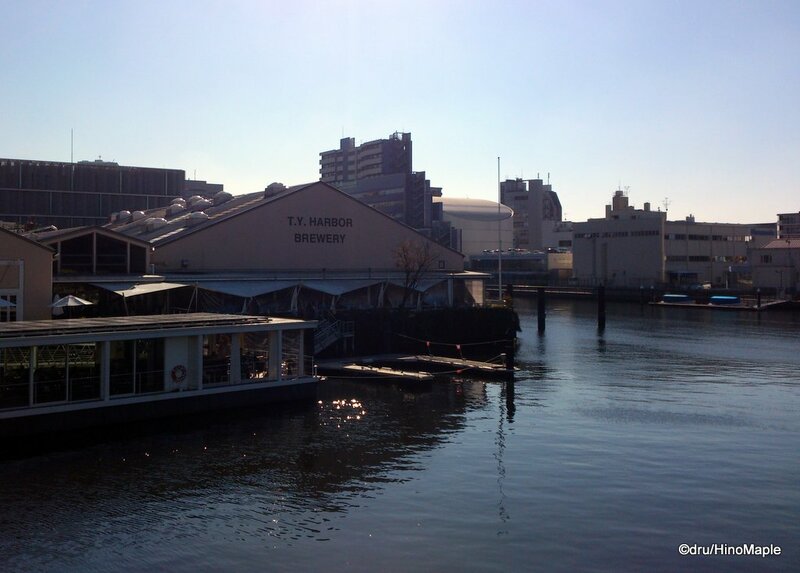 Brewery in Tokyo? Yes! There is another trying to start up this year. They are brewing at another brewery for now and have their own shop, “Two Dogs”. I know of another group trying to set up a brewery, probably in Tokyo too. We’ll see how things go in this crazy city.